Instead of heading to the cleaning aisle, grab yourself a large bottle of vinegar to tackle the sticky, grimy situations in your home. Plain distilled vinegar is a powerful cleaning solution that lets you avoid harsh chemical cleaners. Knowing how and when to dilute vinegar and avoiding certain surfaces makes your homemade vinegar cleaner more effective. Why is the same ingredient you use in recipes good for cleaning your home? The acidity in vinegar makes it effective for cleaning, deodorizing and removing stains. Because it's nontoxic, it makes a good alternative to chemical cleaners. You don't have to worry about using it around kids or pets like you do with those harsh cleaners. On its own, vinegar is a strong acid that can power through tough cleaning situations. Use straight vinegar on surfaces that can handle it. Some examples of using undiluted vinegar include cleaning your toilet bowl, chrome, shower doors and shower curtains and to remove stains from plastic containers. If your shower head has built-up gunk on it, use a twist tie to secure a plastic bag of vinegar over the shower head so it's submerged and leave it for several hours or overnight. Adding water to your vinegar cleaning solution helps dilute the acidity to make the homemade cleaner safe for many surfaces. You can dilute your vinegar in different ratios depending on how strong you want it. A mix of equal parts water and vinegar is a common vinegar cleaner recipe that works well for most general cleaning purposes. You can use this solution to clean windows, refrigerators, doorknobs, faucets and many other hard surfaces as long as they're not prone to damage from acidic cleaners. This solution also works on carpet stains, but you should always test it in a discrete spot to check for potential issues. Some cleaning situations only need a little vinegar to do the trick. For cleaning tile or floors, mix 1/2 cup of vinegar into 1 gallon of water. Using a smaller amount in your vinegar and water cleaner lets you take a cautious approach if you're concerned about damage. You can add other ingredients to your vinegar solution for additional cleaning power. 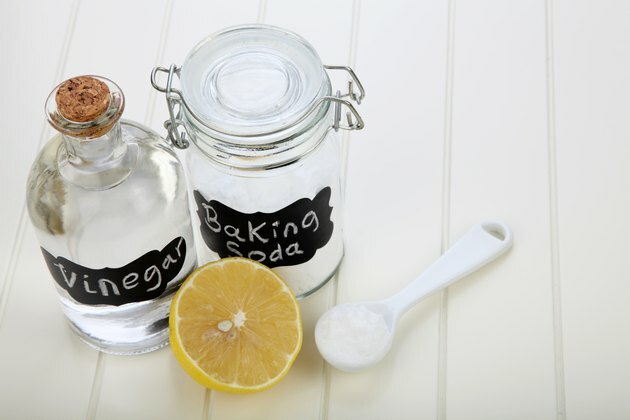 Mixing together equal parts of baking soda and vinegar works for scrubbing stained mugs, grill grates and shower surfaces, or make a paste with the two ingredients to clean stubborn carpet stains. You can also use the baking soda and vinegar combination to clean out your drains. Another option is to add essential oils to your vinegar cleaner. The essential oils add a pleasant smell to the cleaner, and they may add other benefits to the mix. For example, tea tree oil is antiviral, disinfecting and antifungal. Despite its cleaning power, vinegar isn't good to use everywhere. Because it's acidic, vinegar can damage certain surfaces, which means you'll want to find a different cleaning product for those areas. Using vinegar on those items can result in costly repairs or the need to completely replace the item. Natural stone such as slate, granite and marble can become etched if you use vinegar on it. You can also ruin unsealed grout with vinegar. It's best to find a different cleaner for wood, including hardwood floors. Vinegar sometimes damages the finish on hardwood flooring. Certain appliances around your home aren't a good match for vinegar. Always keep vinegar away from electronics. You should never use vinegar inside your iron to clean it out, as the vinegar can damage certain parts inside. Vinegar can also damage the rubber parts inside your dishwasher, so it's best to find another way to freshen the appliance. Will Vinegar Harm Any Part of a Toilet Tank?